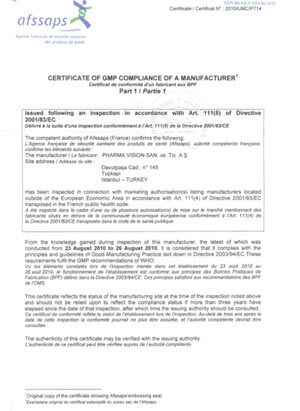 After the EU inspection by the French Health Authority, AFSSAPS on 23-26 August 2010, we received our EU GMP Certificate with the cover letter of December 29th, 2010 of the aforementioned institution. This certification approves our experience and quality at the same time and indicates a further stage in our efforts for the realization of our goals for export-oriented production. We are proud and glad to share this achievement with our employees and partners.